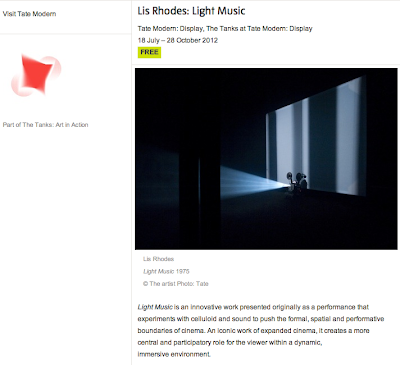 Lis Rhodes recent work, Light Music is installed in Tate Modern, London, Uk from 18th July - 28th October, 2012. 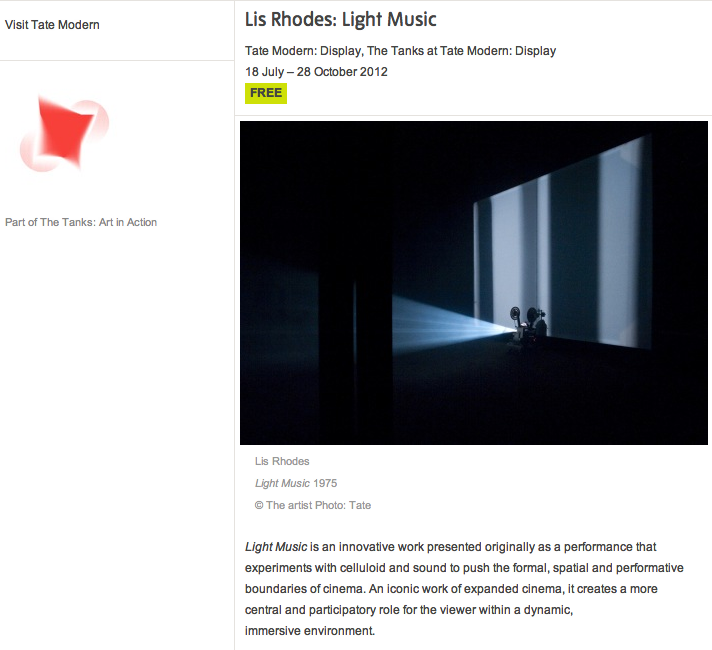 Light Music is Rhodes�s response to what she perceived as the lack of attention paid to women composers in European music. She composed a �score� comprised of drawings that form abstract patterns of black and white lines onscreen. 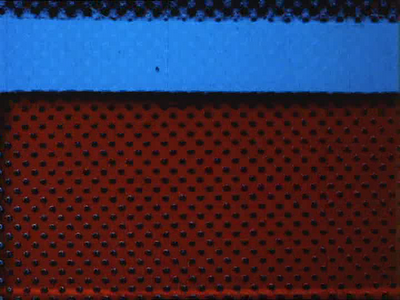 The drawings are printed onto the optical edge of the filmstrip. As the bands of light and dark pass through the projector they are �read� as audio, creating an intense soundtrack, forming a direct, indexical relationship between the sonic and the visual. What one hears is the aural equivalent to the flickering patterns on the screens." On this webpage, you can view a documentary created by Tate Modern as part of their 'The Tanks: Art in Action'. Lis Rhodes talking about her work and the ideas at work and discusses the ideas at work, from synchronisaiton, documentary, commercial fiction. Rhodes "made a film without a camera where the sound track is exactly the image and the image is exactly the sound track. That relationship between an image and a sound, instead of being maybe added later, maybe dubbed was actually synced from the moment it was made, exactly. So what you see is what you hear."